You’ve decided to pop the question and now the ring shopping begins. But how are you supposed to know that you’re buying a good diamond? The following are tips on how to pick out a diamond. The cut of the diamond will fit a certain setting, whether that is heart shaped, oval or circular depends on the ring you’re looking at. The cut or shape the diamond takes needs to have good proportioning, symmetry, and a good polish. All these factors will determine whether the diamond has an excellent cut. 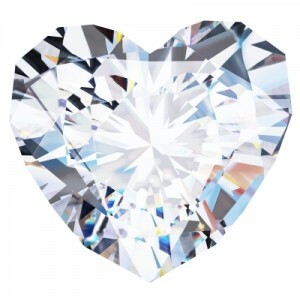 The carat is the weight of the diamond which can be converted into milligrams and grams.This also will be determined by the cut, whether it is a big gem stone or a smaller one. The size can also be expressed in millimeter and centimeter. Diamonds come in different colour qualities. These can be graded on an alphabetical scale; D,E,F,G,H,I are all white colour indicators. Diamonds can also have a pigmentation to them as well making the diamond appear yellow, pink or blue. The blue scale is also determined alphabetically; D,E,F are blue-white indicators. Clarity can only be determined with a microscope. The clarity is what you can see in the diamond. SOme diamonds have tiny fissures and cracks that you can’t see with the naked eye, but can be found with the aid of a microscope. Clarity is graded on a chart of flawlessness. The higher the level of flawlessness the more expensive and the better the clarity. You can check the clarity chart here. Now that you’re armed with some diamond knowledge you can make a more informed purchase. And if you’re not too sure how much to spend read our blog about how much you should spend on engagement rings.